Whoa! That's a really nice setup you have Babaracus! It's a like a shrine to Berserk. The chains holding up the Berserk sword put that extra little touch! Nice Sovel! That Berserk Locus looks so pretty. Guys, I just received my Headlong Bust. Yeah that bust looks really sick. Definitely take pictures and share when you have it painted! Congrats! How big is this? Yes yes The Beast of Darkness is right. Sorry guys, like I said in my topic I won't tell the price, please respect that. I will for sure post pictures of the bust when I'll get it painted, not by me obviously, I don't have the stuff to handle this kind of painting. So I will look for the best painter in my area. I had to make them "safe." Luckily Puck was able to help out. I told myself I wasn't going to buy anymore and then they decided to release this! Soooo jello right now , it looks awesome . I want one . Haha nice censorship, thanks for posting pictures. AOW emailed me about shipping mine over, so I should have it soon. That black cloth/ material inside the box adds a nice touch. Maan, just got reminded how awful Casca's face is. Just got mine too. Feel kinda bad for never posting any photos so here goes. Sadly I only got my cellphone camera so sorry its not top notch quality. Notice my sweaty hand? And yeah, if you lean your head and look really close Casca's face is pretty much terrible, but as long as you don't do that it actuall looks alright imo. I ll receive mine at the end of december. 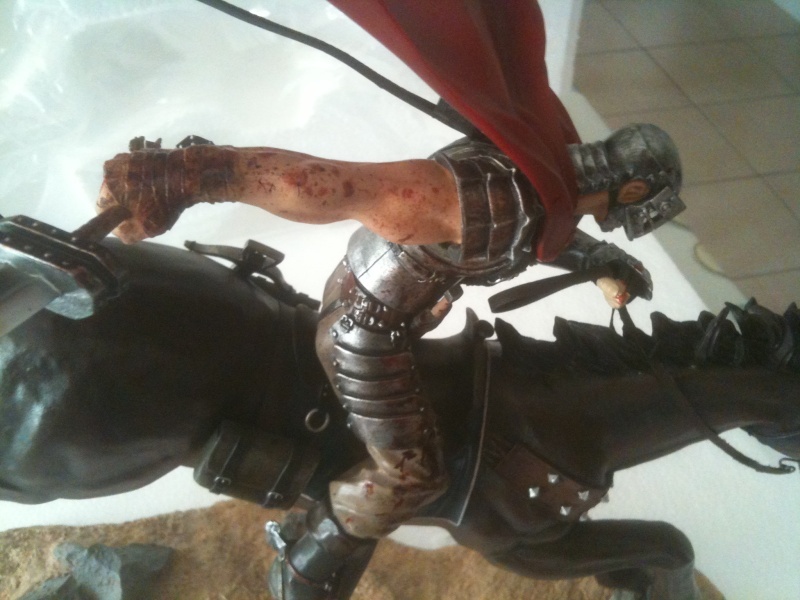 This Guts on Horse is amazing!!! 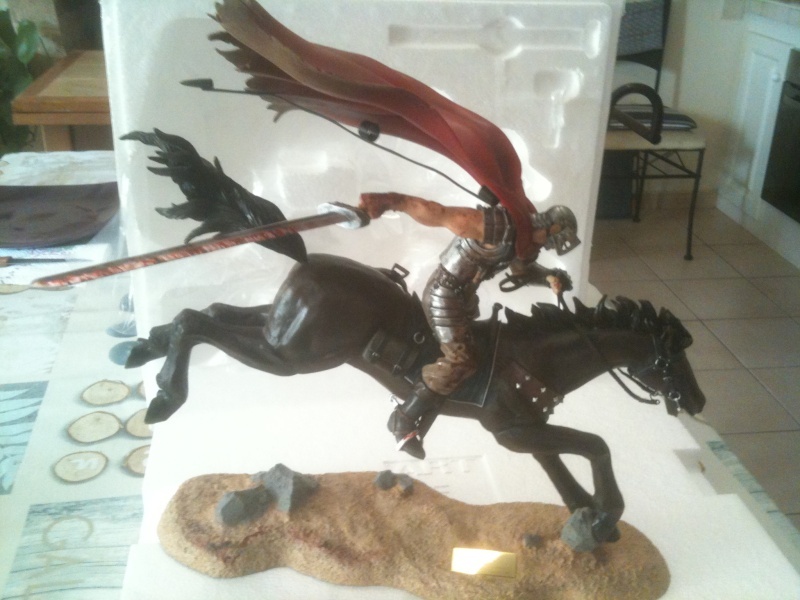 Yep this statue is great but a bit deceived the box looks soooooo cheap! That is the cheapest packaging u can ever have. Lots made in china 5$ goods are using these kind of cloth packaging. Indeed, but its too big for my shelf to be displayed. Speaking of which, I just realized I wont be able to display the last re-paint til I move to a bigger flat...crap. Tbh I thought it was gonna be smaller, with all the negative critisism everyone threw at it when it was announced and all. I have to admit Im especially satisfied with it on that point. Think my "Kingdom of Falconia" gotta be samller, dont remember the scale on that one though. Haha! I got mine right in front of vol.13 too. I was a bit worried that it might not have been "the right way" to display it at first but now that I see another member do it too its kind of a relief The idea originally spawned from limited space at the book section though.